Received August 11th, 2010; revised August 25th, 2010; accepted September 10th, 2010.
bench blasting. Emission factors for dust concentrations were developed in gram per cubic meter of rock excavated. conducted at another coalfield of India for two seasons. It was found that the emission factors are site-specific. orological conditions at the mine site. factor in other mines is also presented. ferent units by the different countries. factors is the USEPA document referred as AP-42 . with blasting depth 21 m as it is reported in USEPA . 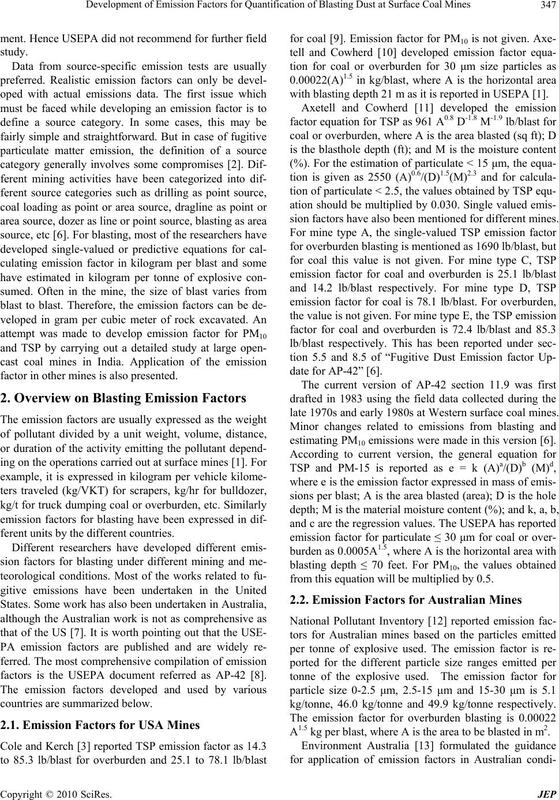 sion factors have also been mentioned for different mines. late 1970s and early 1980s at Western surface coal mines. 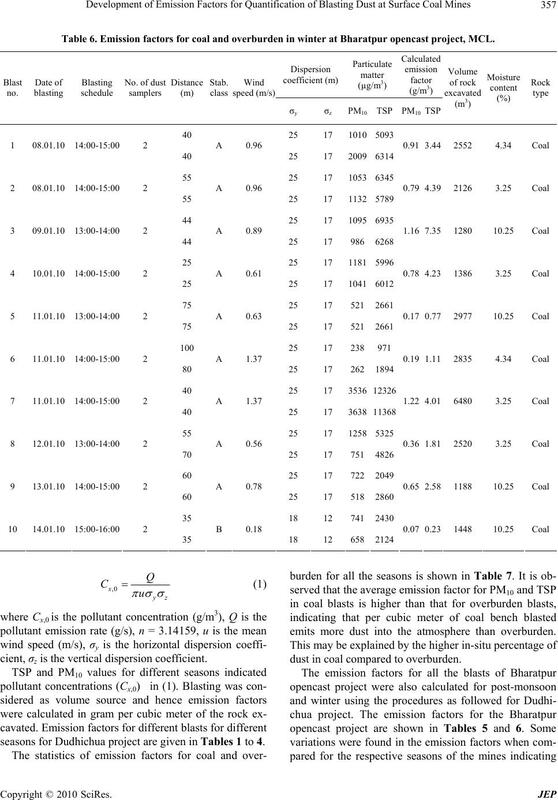 estimating PM10 emissions were made in this version . from this equation will be multiplied by 0.5.
kg/tonne, 46.0 kg/tonne and 49.9 kg/tonne respectively. A1.5 kg per blast, where A is the area to be blasted in m2. will be multiplied by a factor of 0.52.
in the USEPA document AP-42  can be used. 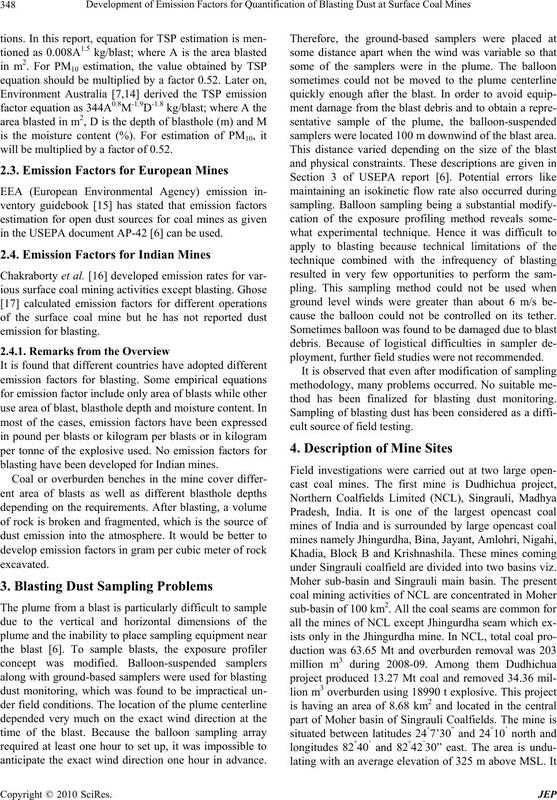 blasting have been developed for Indian mines. anticipate the exact wind direction one hour in advance. samplers were located 100 m downwind of the blast area. cause the balloon could not be controlled on its tether. ployment, further field studies were not recommended. thod has been finalized for blasting dust monitoring. cult source of field testing. under Singrauli coalfield are divided into two basins viz. benches including three in coal and seven in overburden. ment are electric shovels, draglines, dumpers, dozers, etc. similar to those of Dudhichua project. overburden had suitable locations for dust monitoring. number of data collected for coal and overburden benches. from season to season, particulate matter can also vary. responded to blasting dust monitored benches. both the seasons, only coal benches were monitored. conditions were not suitable for dust sampling. weight of dry materials. It is expressed in percentage. content was carried out in each season. riod. The details corresponded to dust monitored benches. was 7 m for all the blasts. Spacing was either 7 m or 8 m.
benches. The blasthole depth varied from 12 m to 19 m.
while spacing was 9 m or 10 m.
spacing was 9 m to 10 m.
monitoring. Blasthole depths varied from 3 m to 7 m.
Burden and spacing varied from 3 m to 5 m.
or 4.5 m. Spacing varied from 4 m to 5 m.
tion system for fractionating the particulate matter sizes. ume (in cubic meter) [20,21]. V available inside the cabins of heavy duty machineries. cult to identify the contribution of dust by the blasting. itoring period, etc were discarded. background dust concentrations was ignored for analysis. for blasting dust monitoring period was used. 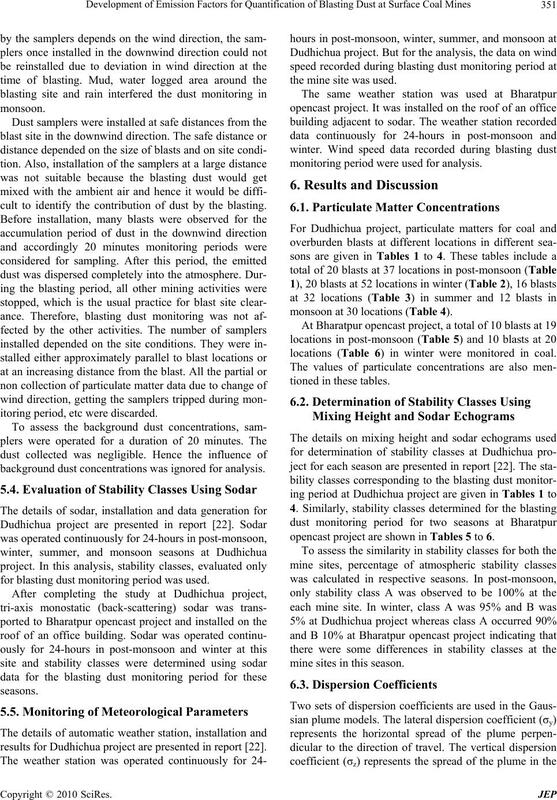 results for Dudhichua project are presented in report . the mine site was used. 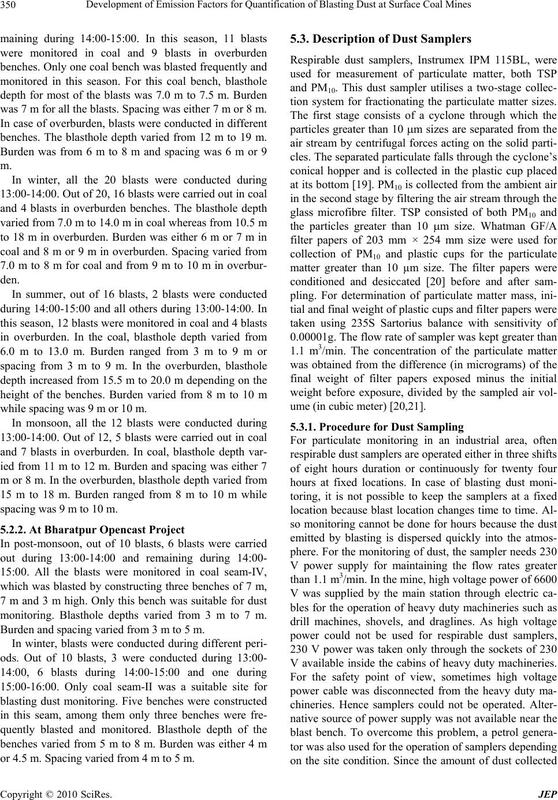 monitoring period were used for analysis. monsoon at 30 locations (Table 4). 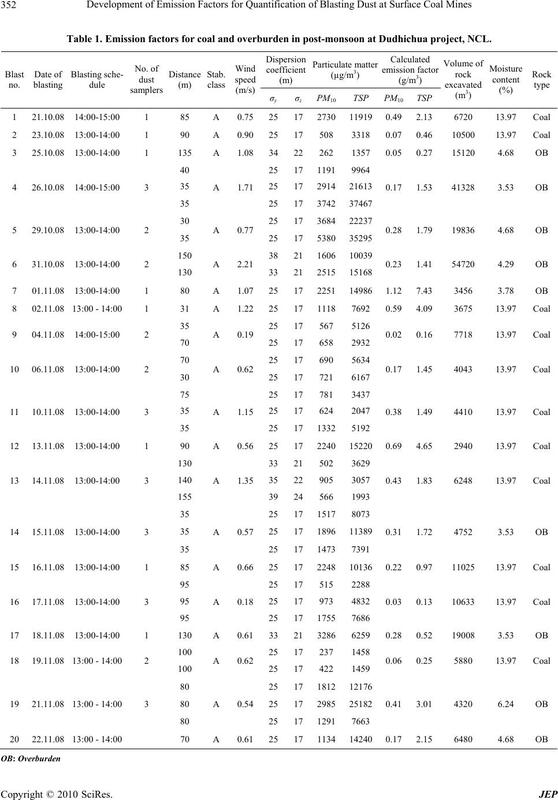 locations (Table 6) in winter were monitored in coal. 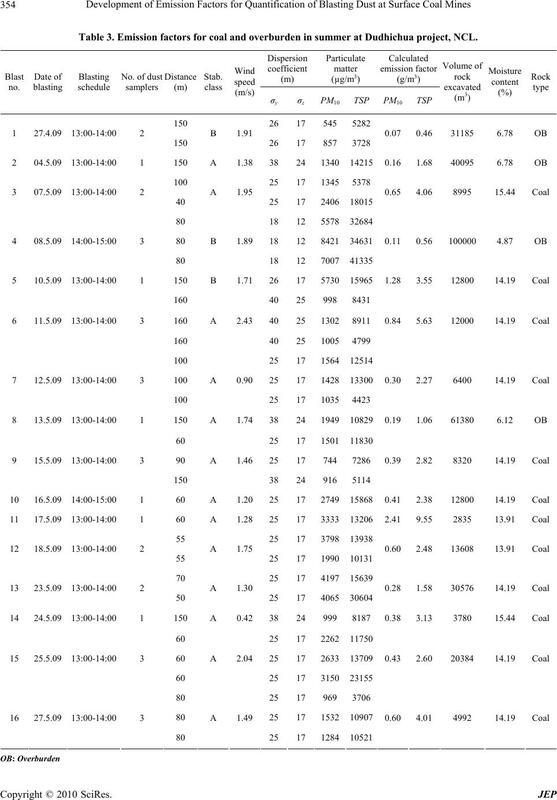 opencast project are shown in Tables 5 to 6.
mine sites in this season. Table 1. Emission factors for coal and overburden in post-monsoon at Dudhichua project, NCL. Table 2. 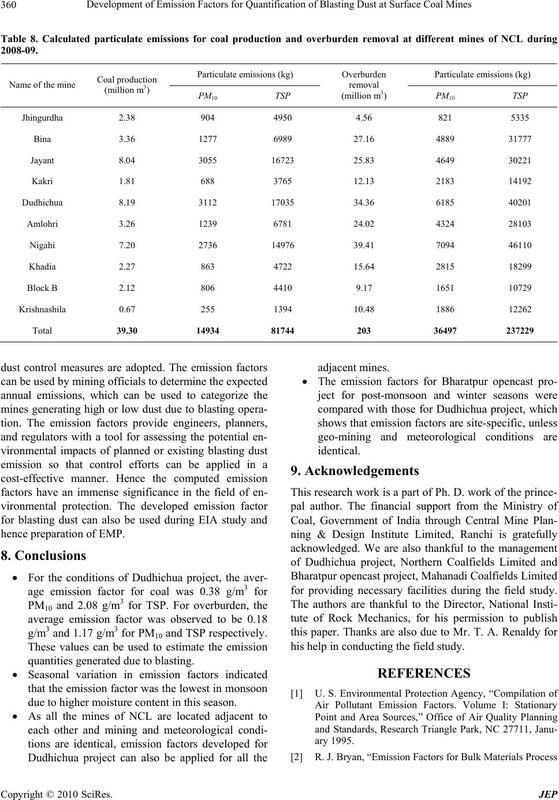 Emission factors for coal and overburden in winter at Dudhichua project, NCL. Table 3. 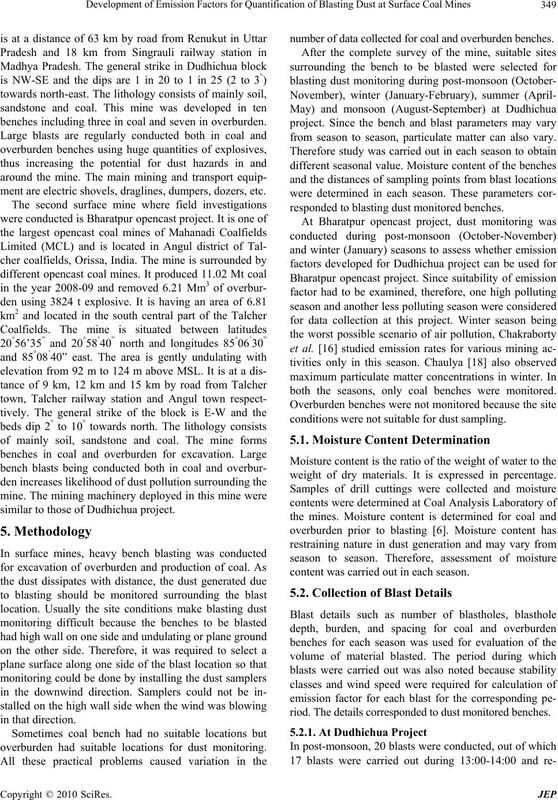 Emission factors for coal and overburden in summer at Dudhichua project, NCL. Table 4. Emission factors for coal and overburden in monsoon at Dudhichua project, NCL. Table 5. 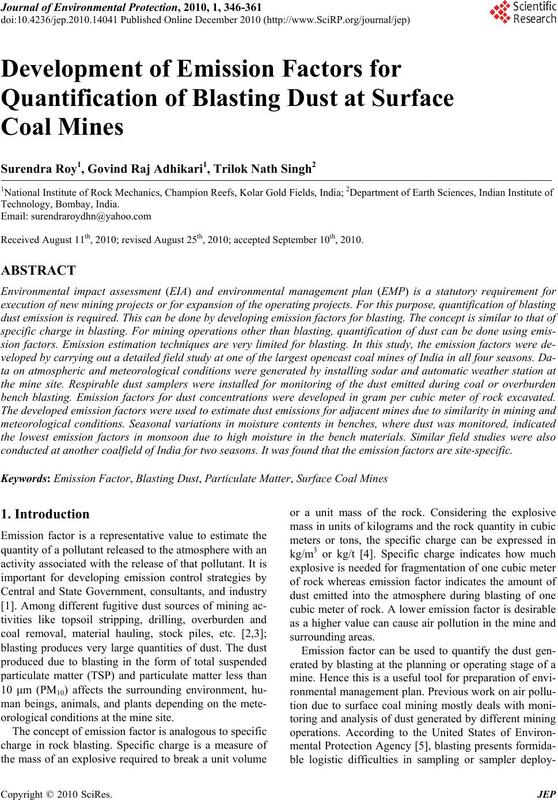 Emission factors for coal and overburden in post-monsoon at Bharatpur opencast project, MCL. 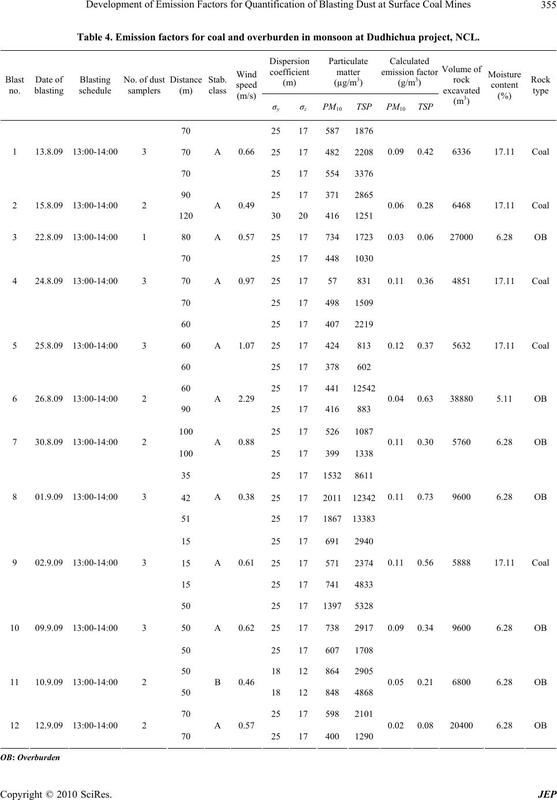 project are shown in Tables 1 to 4.
dispersion coefficients are shown in Tables 5 and 6.
opencast project are given in Tables 5 and 6. Table 6. Emission factors for coal and overburden in winter at Bharatpur opencast project, MCL. cient, σz is the vertical dispersion coefficient. 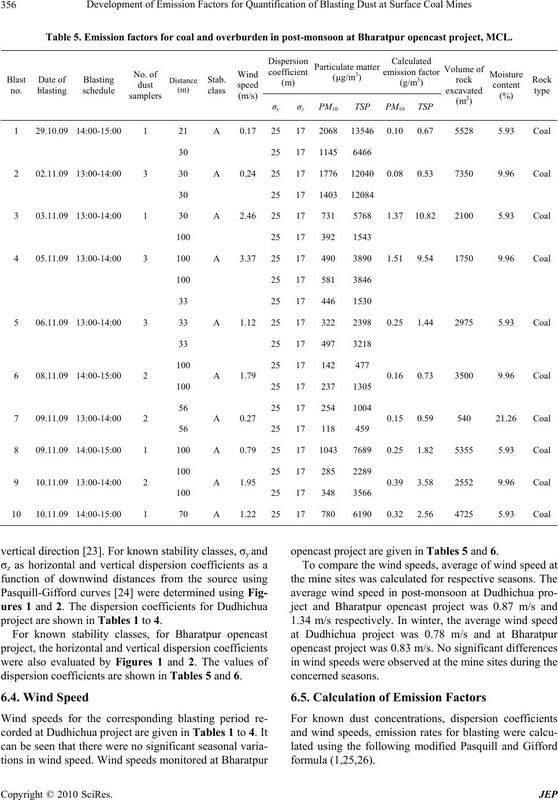 seasons for Dudhichua project are given in Tables 1 to 4.
emits more dust into the atmosphere than overburden. dust in coal compared to overburden. that emission factors are site-specific. the reason for decrease in emission factor in this season. when the moisture content is higher and vice versa. 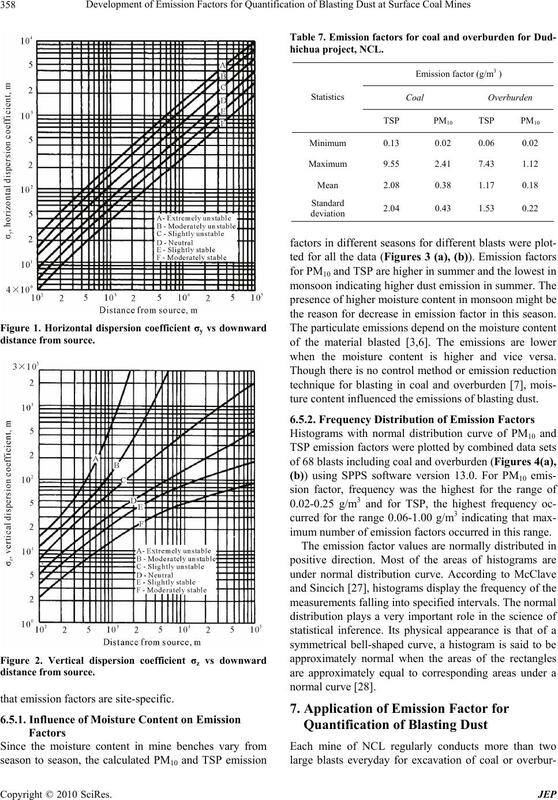 ture content influenced the emissions of blasting dust. imum number of emission factors occurred in this range. of TSP at Dudhichua project. 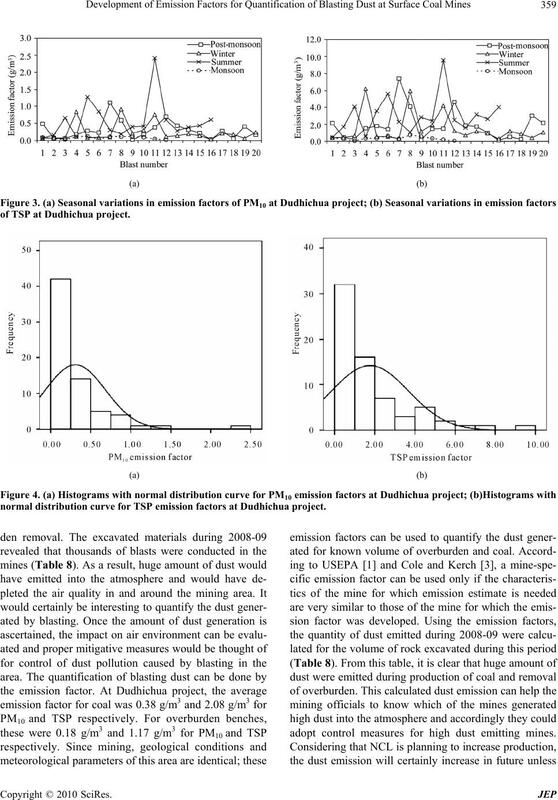 normal distribution curve for TSP emission factors at Dudhichua project. adopt control measures for high dust emitting mines. g/m3 and 1.17 g/m3 for PM10 and TSP respectively. 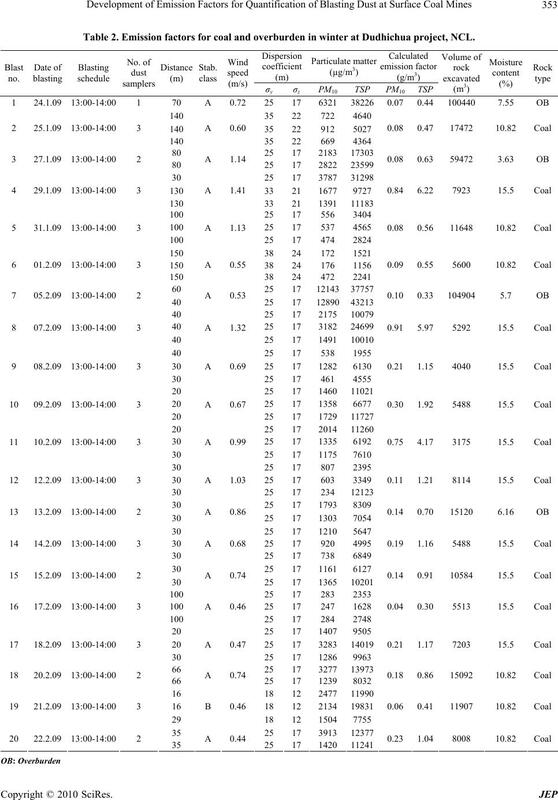 quantities generated due to blasting. due to higher moisture content in this season. for providing necessary facilities during the field study. his help in conducting the field study. Conference, San Francisco, February 1988, pp. 336-352.
ing, Metallurgy, and Exploration Inc., Colorado, 1990, pp. Fragmentation, Vol. 4, No. 1, 2000, pp. 19-33. 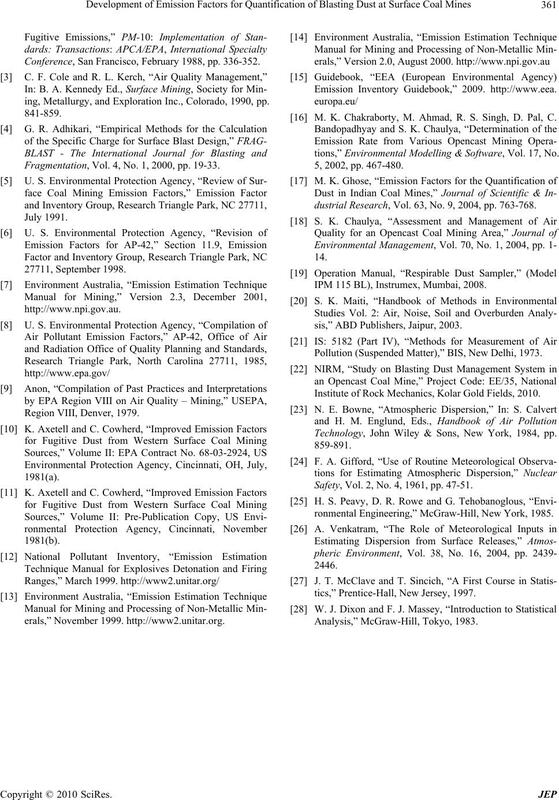 Emission Inventory Guidebook,” 2009. http://www.eea. M. K. Chakraborty, M. Ahmad, R. S. Singh, D. Pal, C.
tions,” Environmental Modelling & Software, Vol. 17, No. dustrial Research, Vol. 63, No. 9, 2004, pp. 763-768. IPM 115 BL), Instrumex, Mumbai, 2008.
sis,” ABD Publishers, Jaipur, 2003. Pollution (Suspended Matter),” BIS, New Delhi, 1973. Institute of Rock Mechanics, Kolar Gold Fields, 2010. Technology, John Wiley & Sons, New York, 1984, pp. Safety, Vol. 2, No. 4, 1961, pp. 47-51.
ronmental Engineering,” McGraw-Hill, New York, 1985.
tics,” Prentice-Hall, New Jersey, 1997.